Ballyclare Comrades manager, David Dorrian. David Dorrian says he excited about the challenge ahead after he was appointed manager of Ballyclare Comrades, writes John Gillespie. The 50-year-old, who had been assistant at Dixon Park, was confirmed as the new Reds’ boss less than 24 hours after Eddie Hill resigned on Saturday. It’s a bit of a baptism of fire for the Carnmoney man as the Comrades hover six points above the drop zone with six games left to play. 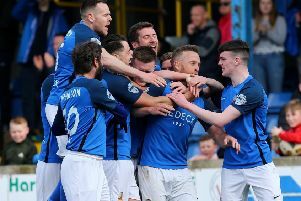 But the former Ballymena United reserve team boss has stacks of coaching experience and he’s hopeful there is enough quality in the ranks to preserve their status in the second tier of the Irish League. “I’m excited about the job and looking forward to it. It certainly is a big challenge,” he said. “The thing about us as a team is that we have done pretty well against better footballing sides. We had a great match against Dungannon Swifts in the Irish Cup. We ran them close and ultimately ended up getting beat on penalties. Dorrian, who arrived at Ballyclare earlier this season said he was sorry to see Hill go.